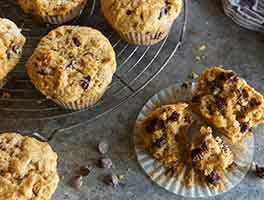 A classic breakfast treat made gluten-free — thanks to our gluten-free flour. Note: You must use a stand mixer or electric hand mixer to prepare the batter; mixing by hand doesn't do a thorough enough job. Preheat the oven to 375°F. 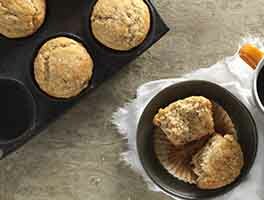 Grease a 6-cup muffin pan. Whisk together the melted butter or oil, egg, milk, and vanilla. Using an electric mixer, slowly beat the milk mixture into the dry ingredients. Scrape the bottom and sides of the bowl and continue beating at medium speed until the batter thickens, about 30 seconds. Fill the muffin cups almost full. Sprinkle with cinnamon-sugar. Bake the muffins for 20 to 25 minutes, until a cake tester or toothpick inserted into the middle of a muffin comes out clean. Remove from the oven, and after 5 minutes transfer to a rack to cool. 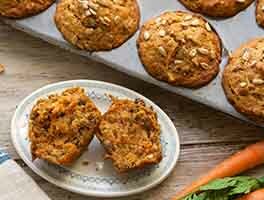 Note: For a dairy-free version of these muffins, substitute soy milk, almond milk, or rice milk for the milk called for in the recipe. Results may vary from the original. 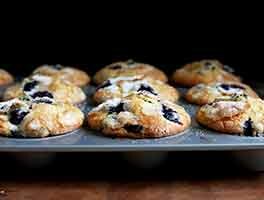 Tried other GF blueberry muffin recipes and they were gummy and too sweet - just not good. Made a double recipe of these (12) using flax meal instead of hi-fiber maize and they came out great! Thanks for another keeper! I used my own gluten-free flour mix, frozen blueberries, substituted flax-meal for fiber as several comments have suggested earlier and sprinkled a bit of brown sugar on top. Turned out perfect, they were airy and delicious! Delicious! I used whole frozen cranberries instead of the blueberries and added a half-cup of chopped walnuts. Used ground flax seen in place of the maize fiber stuff, simply because I had the flax seed. Next time, I would chop the cranberries. Overall, I was very pleased, and the recipe is easy to make. This recipe was loved by my children, but I'm still on the fence. The pancakes turned out gummy inside even though we cut down on the Xanthum Gum as suggested by others. I've tried it twice now, but maybe a third time will be best version. 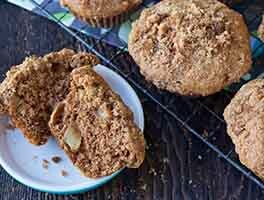 I finally found a gf recipe for muffins that doesn't taste like sand! These were wonderful. And it doesn't get any easier when you're using the flour mix. I used flaxseed meal in place of the fiber stuff, fresh blueberries and almond milk instead of cow's milk. It was all perfect -- color, consistency, taste, everything. I shared them with a gf family in my neighborhood. They didn't believe these muffins were gf and immediately wanted the recipe. Thank you!!! Made this recipe for breakfast this morning. Omitted maize fiber stuff and subbed 1/4 KA GF flour. Then I doubled the recipe and cooked as a blueberry coffee cake. I added the zest of one lemon and then topped with cinnamon, sugar and chopped walnuts. Had to bake for 40 minutes, but what a wonderful way to start the day! It was light, fluffy, and delicious. 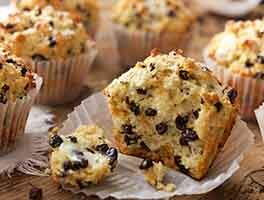 Light and fluffy muffins. I love KAF GF products! I am so impressed with how good they taste and the texture is not like other GF products. I made mine with ground flax instead of the X^&:? stuff and added grated lemon peel. They were tall and filled out very nicely. Not dense or crumbly. They hold together well. Highly recommend this recipe. I am lowering my sugar intake so this recipe was just perfect. I really like the taste and it looks good too. My daughter likes them also. My only regret was that I didn't double the recipe!